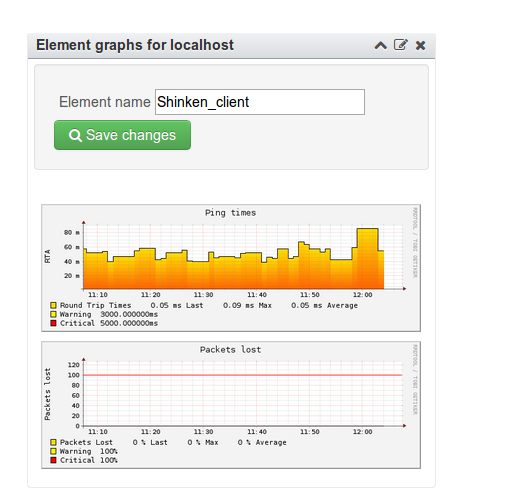 Shinken is an open source monitoring framework based on Nagios Core which has been rewritten in python to enhance flexibility, scalability, and ease of use. Shinken is fully compatible with Nagios and supports its plugins and configurations that can be used on the go without rewriting or adjusting. Shinken has no limits regarding distribution. It can be scaled to the lan LAN, through the DMZs and even across several datacenters. Shinken goes beyond the classical monitoring functions of Nagios, allowing distributed and highly available monitoring of assets, a smart and automatic management of VMware topologies and different hypervisors (Xen,KVM,...), and is able to monitor Amazon EC2 hosted applications (like mysql & Apache) automatically. Shinken is considered 5 times faster than Nagios, and comes with a large number of monitoring packages that can be easily installed, providing a faster way to start monitoring servers, services, and applications. In this guide, we will configure two droplets. One will be configured as the server, the other as a client. They both will run Ubuntu 12.04 LTS. We will start with the Server using the automated installation script. The install script will create the user and group. Install all dependencies and then process Shinken installation. Once the installation is done, the shinken WebUI can be accessed using the http://X.X.X.X:7767 and the credentials admin/admin. The configuration folder will be located in /usr/local/shinken/etc. Before diving in the configuration process of Shinken, we need to secure its WebUI. Error : you didn't define a WebUI module for saving user preference like the Mongodb one. You won't be able to use this page! For our scenario, we will start by declaring the Ubuntu 12.04 monitored host (Shinken slave), install and configure SNMP on it, and then monitor it using a custom community string. Once it's done, we'll use FTP and SSH package to check FTP & SSH states on the slave as an example on how to use packages. Packages are predefined monitoring templates for generic or specific services, appservers, operating systems and monitored-capable devices. These packages are located in the following directory /usr/local/shinken/etc/packs categorized by type, and to use them we only need to specify their names on the host definition file. Since Shinken is fully compatible and supports Nagios, Nagios plugins can be added and used through Shinken. Copy and paste the following content and change the “host_name”, and “address” fields to appropriate values. The "use linux" is the "template" line. It mean that this host will use properties from the default linux template. The “host_name” is the object name of your host. It corresponds to the hostname of our client and must be unique. The “address” is the IP address of the slave or its FQDN. The “_SNMPCOMMUNITY” is the custom SNMP community string or the password. As we mentioned before, we're going to use two packages for monitoring FTP & SSH services. These packages will check the state of publicly available services, applications and protocols without any special access requirements. For that we're going to add them to the host definition file, on the line 'use' separated by a comma. We can use as much as we can, but we need to remember that we only need to monitor what is important. As we mentioned before, we are going to use a custom SNMP community string (password) for our client. For this guide, we chose “DOmonitoring” – it will be the same on the client. We’ll start by installing SNMP on our client. Then we configure Community strings and listening interfaces. As we already mentioned before, we are going to change the SNMP community (password) for our client by changing the default value “public” by a customised one. For the purpose of this tutorial, “DOmonitoring” will be chosen. We will configure it later with custom widgets to get the information needed, but first we need to check if our client is configured and reachable by the server. Click on All tab and you will see a list of all monitored machines, including the server(localhost). Let's go back the dashboard and create one by adding three widgets. Since we have only one monitored droplet, we will add graph, problems and relation widgets. Our monitoring server will keep an eye on our VPS and track of all the changes. The longer the server runs, the more interesting the graphs and stats will become.